The Euro 2020 qualifying opener against the Faroe Islands was earmarked as the game that had to signal the start of a new chapter for the national team. Thankfully, coach Ray Farrugia put to practice what he had preached throughout his 10-month tenure at the helm of the side and managed to kickstart our Euro 2020 qualifying trek with a 2-1 win. Saturday’s triumph ended a 13-year wait for a home victory in a competitive game - the last one dating back to October 11, 2006, when Dusan Fitzel’s team beat Hungary 2-1 courtesy of a brace from Andre Schembri. Since replacing Tom Saintfiet as national team coach, Farrugia has always stressed the importance of being more adventurous in our style of play and highlighted the importance of injecting young blood into the set up as they could add a much-needed enthusiasm into the dressing room. The 2018 UEFA Nations League campaign seemed to be the perfect platform for the national coach to draft in as many youngsters as possible and give them the opportunity to showcase their talent against par-level teams. However, Farrugia opted to preserve a nucleus of veteran players in his squad with only Joseph Mbong and Juan Corbalan managing to breakthrough into the starting XI from the young crop of players selected. Three points in six matches did not make Farrugia look good and much of the criticism he faced was about the fact that the players may have lacked courage in certain instances to play positive football, in particular against the Faroes on home soil. Come the European qualifiers, Farrugia called up several new faces into the team including wingbacks Karl Micallef and Kurt Zammit, midfielders Nikolai Muscat and Matthew Guillaumier along with Mbong, Corbalan, Jake Grech and Kyrian Nwoko. In the build-up of the game, Farrugia did not hide behind the usual diplomatic speeches but instead, as we are now used to, he described this game as a great opportunity to pick up a much-needed victory that would boost the national team environment. In contrast with his approach in the Nations League, Farrugia scrapped the traditional conservative plan and shaped his Malta team into a 4-3-2-1 formation, bringing in several players with more attacking characteristics with the main intent being that of trying to bring home the three points. What followed was the consequence of a gutsy display. “We are always on the look-out for players who can be part of our national team but they need to have the ideal characteristics to fit in our system because that is the only way for us to improve,” Farrugia told the Times of Malta. One risk that Farrugia took is to partner highly-experienced captain Michael Mifsud with Kyrian Nwoko, who this year has been struggling for regular time at Valletta. In fact, he has only made 15 league appearances with the Malta champions so far, with only two being from the start. Nwoko’s selection could reflect Farrugia’s idea of giving these youngsters the platform to showcase their talent on the international stage, a theory which could be further enhanced much more should the rule of 11 foreign players get implemented in the Maltese Premier League. Nwoko, son of former Malta international Chucks Nwoko, took little time to repay Farrugia’s trust by netting his first international goal after a well-engineered move which also involved Rowen Muscat and Paul Fenech. Malta captain Mifsud was particularly enthusiastic about the performance of the young players against the Faroes and has no doubts that the national team has a bright future ahead. Birkirkara midfielder Matthew Guillaumier showed great composure on his debut, particularly in the first half where he was finding open spaces for himself before spraying balls to the flanks. “I was told by the technical staff to play my own style, without adding anything extra. That gave me a lot of confidence and I feel that I translated that into a satisfying debut,” he explained. Undoubtedly, one factor that made the difference in this tie was that Malta remained focused throughout the whole game unlike in the Nations League appointments where a few individual mistakes proved costly for the side. 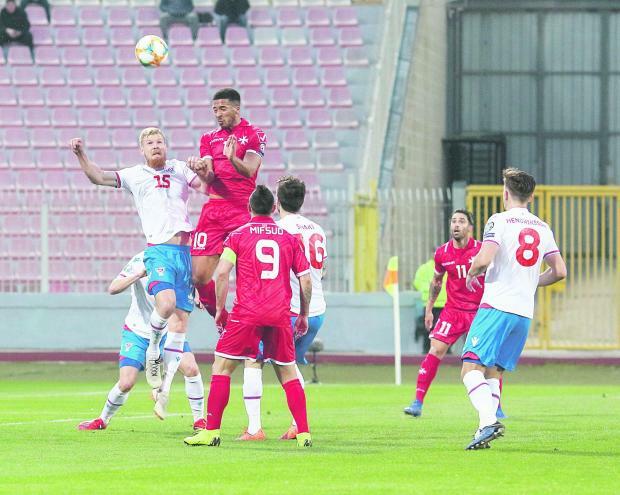 Defender Steve Borg, who netted his first goal for Malta, explained how the team had been preparing for a long time for this match and they were aware of their previous mistakes. “We have been waiting to play this game for so long and during preparation, we saw a lot of clips of our mistakes with our technical staff so that helped us read the game much better,” the Valletta defender said. Moreover, the Maltese players showed nerves of steel when under pressure, particularly, when Andrei Agius was given the marching orders early in the second half. Henry Bonello’s save from the penalty spot was the turning point of the game because it motivated the home side much more. “It was a collective effort, especially when we were a man down,” Bonello said. One hopes that such performance will become the benchmark for the national team – a display of grit, determination and creativity – the pillars on which Farrugia is basing this team on. It seems that Farrugia can now bank on several players who can cover a variety of roles while also providing quality to the team. The idea of playing the ball from the back is becoming pivotal for the side and the players able to take the responsibility are also increasing – with Agius at the back, Guillaumier in the middle and Nwoko, who is able to help the team inch their way up on the field, Malta can strive towards becoming more methodical in their way of play, scrapping once and for all the Route One system. It is understandable that the team cannot adopt the same attacking approach shown against the Faroes against tougher oppositions, starting from tomorrow against heavyweights Spain. However, adding more tactical modules to the team will help the players become more versatile and more confident when moving from one system to another. Such approach will help players to express themselves better and better yet, maybe giving themselves the opportunity for an experience overseas. Hopefully, overcoming the challenge of a team sitting 97th in the FIFA rankings, 85 places above Malta, was the starting point of this new journey.